That’s no moon, that’s a limited edition Star Wars collaboration with Away. In celebration of Star Wars Day, the ever-popular Direct-to-Consumer suitcase brand created three limited edition transparent colorways that showcase three plants (well, two planets and one moon) from the Star Wars universe. The orange represent the dust and dunes of Luke Skywalker’s home planet, Tatooine. The icy blue/white is the whipping winds and deep snow banks of Hoth (no Tauntaun required). And the green is to celebrate the forest moon of Endor and it’s lovable, furry inhabitants, the Ewoks. Each shell is not only colored, it’s transparent to showcase the interior lining that features inspiration from those planets, transformed into an abstract pattern. Hoth gets the Imperial Droid, Endor features a mash of AT-ATs, and Tatooine showcases the iconic domed shape of the Lars homestead. Star Wars branding can sometimes be a bit over-the-top, but these Star Wars x Away bags are subtle in their delivery. 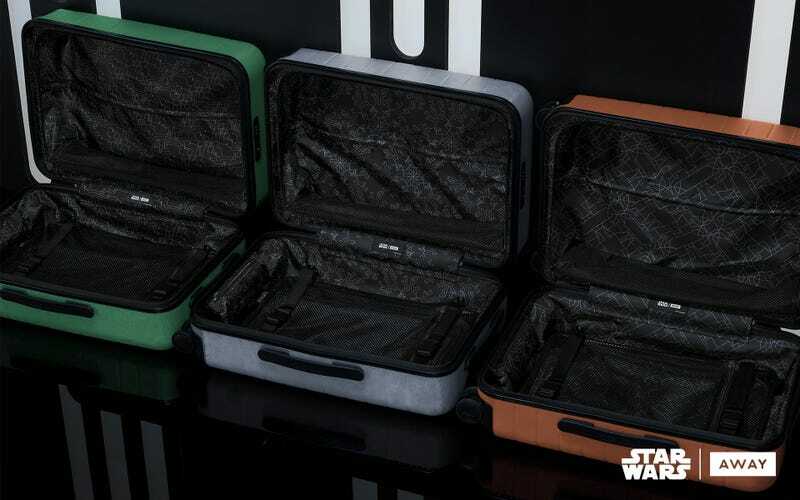 These are only obviously Star Wars in the matte black embossed handle with the Star Wars x Away name, and the custom Millennium Falcon luggage tag. Each color is limited edition and will run you the same as the normal Away collection. Choose from The Carry-On, The Bigger Carry-On, The Medium, and The Large. It is your destiny.